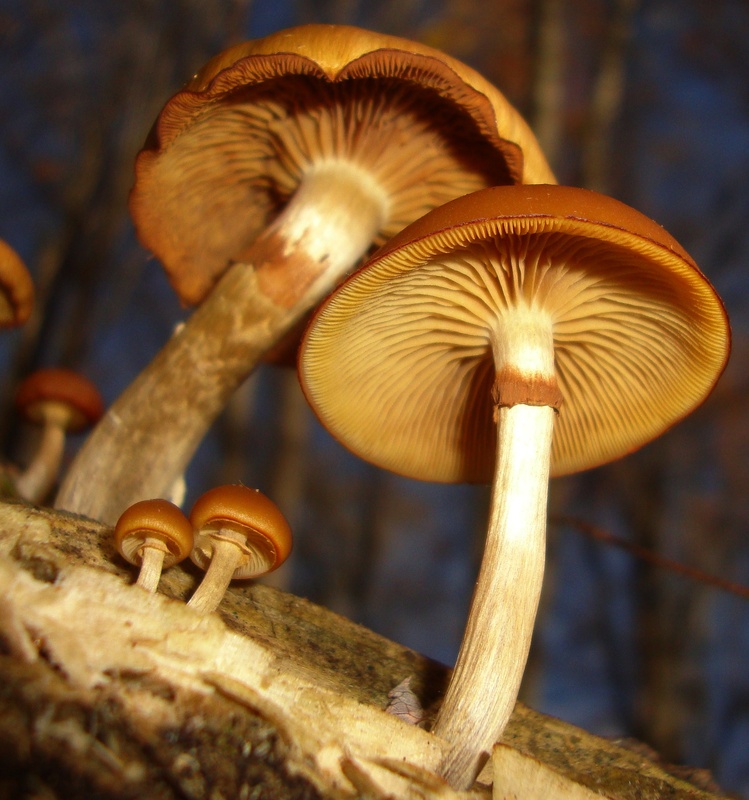 Are you afraid of dying by mistaking a lookalike for the real Psilocybe cyanescens? Don’t let it deter you from enjoying some of nature’s greatest, most beautiful of gifts. 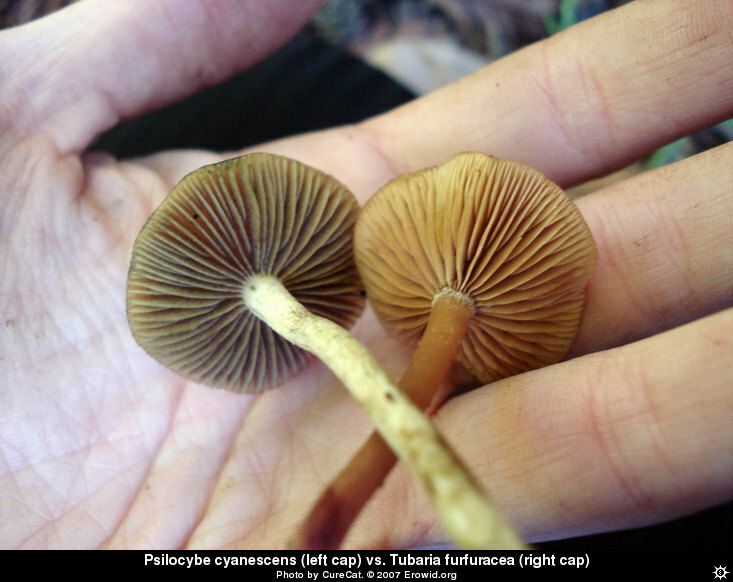 This post will act as a visual comparison guide to Psilocybe cyanescens and its lookalikes. Download our offline version with more images! So I figured I would start with an iconic representation of our goal here. 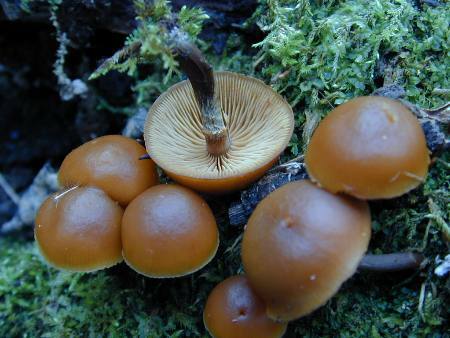 The ‘Wavy Caps’ are defined by their characteristic waviness after the cap has opened. In young age, the caps can look sort of like bottle caps. In the photo above, you can see the emerging bottle cap shape and the cobwebby cortina that’s about to seperate from the cap and may eventually leave a trace of an annular zone. Sometimes the zone will be purple because it catches falling spores from the lamellae; also a good indicator of P. cyanescens. Here’s a look at the lamellae. They are adnate which means that they are attached to the stipe. The gills are tightly packed but not as tight as most Agaricus spp. They may also bruise blue. So here’s a lookalike that you definitely need to be familiar with. It contains amatoxins that will destroy your liver in a painful way until it kills you. But don’t let this deter you from finding the real magic that you desire. All you need is to be equipped with knowledge and TAKE SPORE PRINTS! Keep in mind that this mushroom also displays hygrophaneity. The cap will turn from brown, to a pale or cream color after drying. 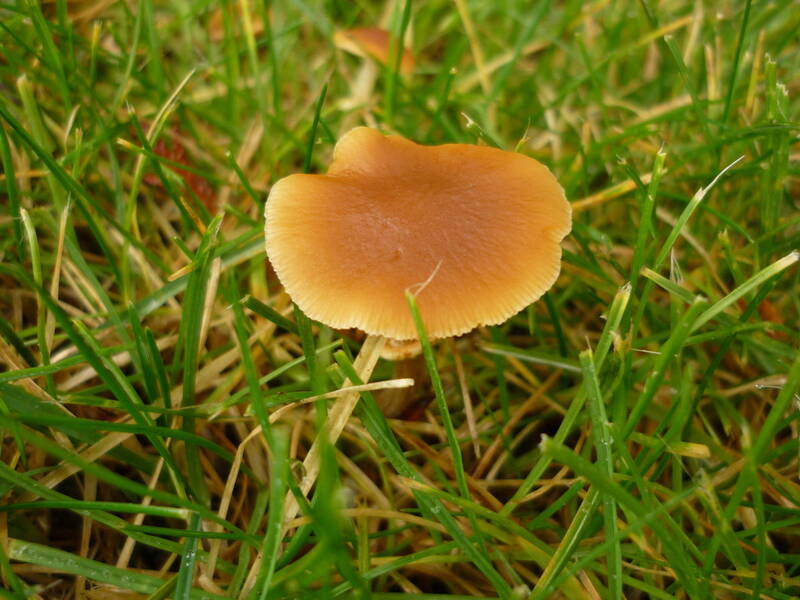 Notice how similar its cap can sometimes resemble the waviness just like Psilocybe cyanescens. But once you inspect further, you’ll most likely find a distinct ring around the stipe (annulus), which the true wavy caps do not exhibit. Here is a picture that will most likely come up if you google ‘Pholiotina rugosa spore print’. 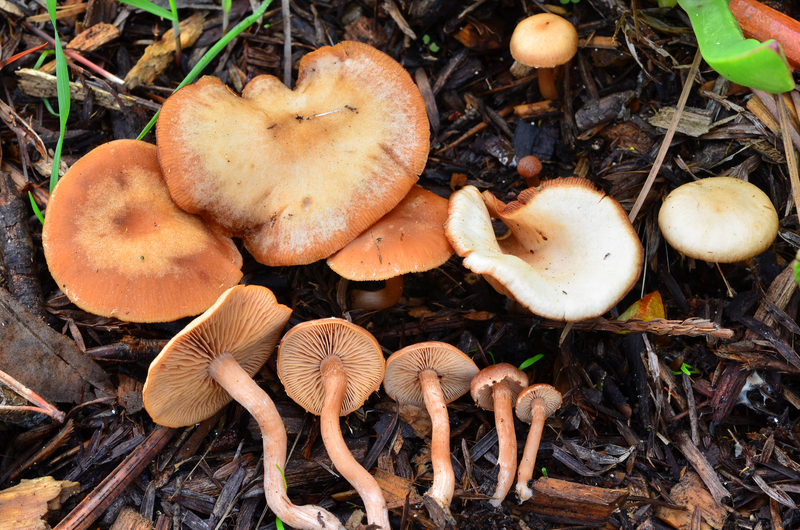 It’s a great side by side comparison of P. cyanescens and Pholiotina rugosa. Tubaria furfuracea is a quite the lookalike as it also is hygrophanous, and it also grows in woodchips. This mushroom isn’t poisonous, but it’s not exactly a choice edible either. What it is for sure, is an LBM just like P. cyanescens. And we’re talking about lookalikes here. 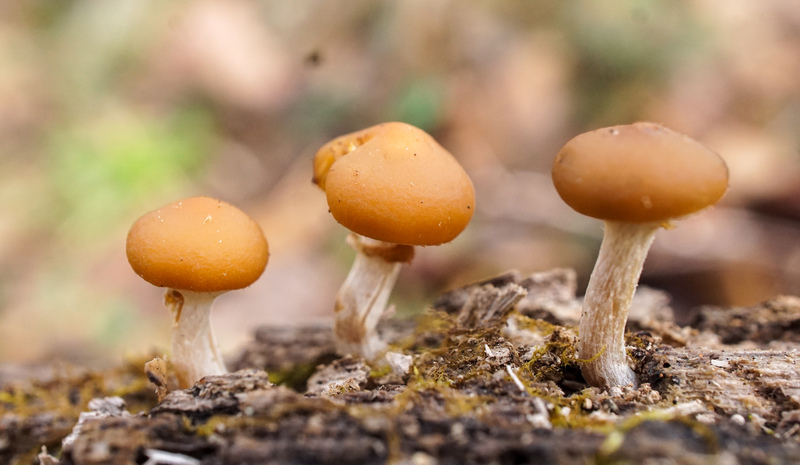 This is one of the more common lookalikes that people will request for ID in the hopes that it’s P. cyanescens. Note that the stipe isn’t white but more along the same color and texture as the rest of the fruiting body. 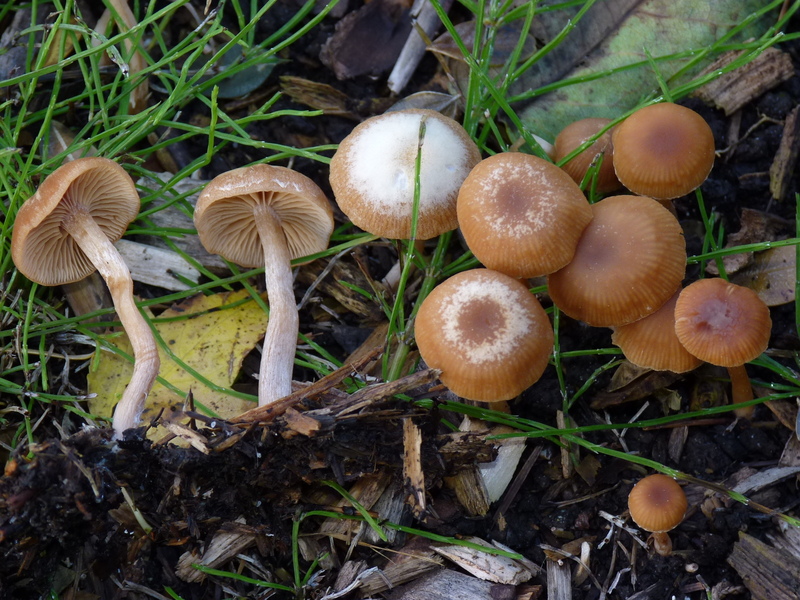 They are also fairly delicate and don’t really bend like P. cyanescens would. The spore print is a pale orange/brown color. The picture below is also quite popular and can be found on erowid.org and shroomery.org. It’s Tubaria furfuracea held alongside P. cyanescens. 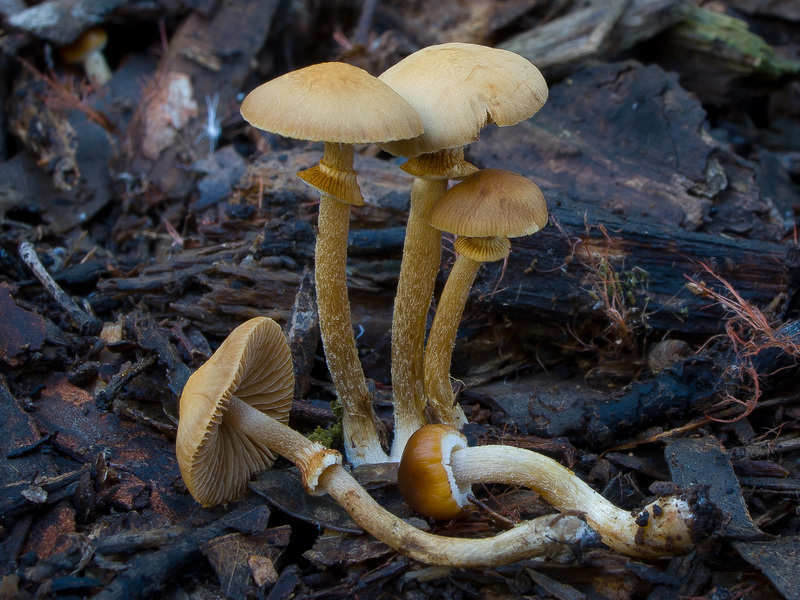 Another extremely common deadly lookalike to P. cyanescens. It also has a rusty orange spore print like Pholiotina rugosa and typically has an annulus. Notice the black bruising on the stipe in the below picture. 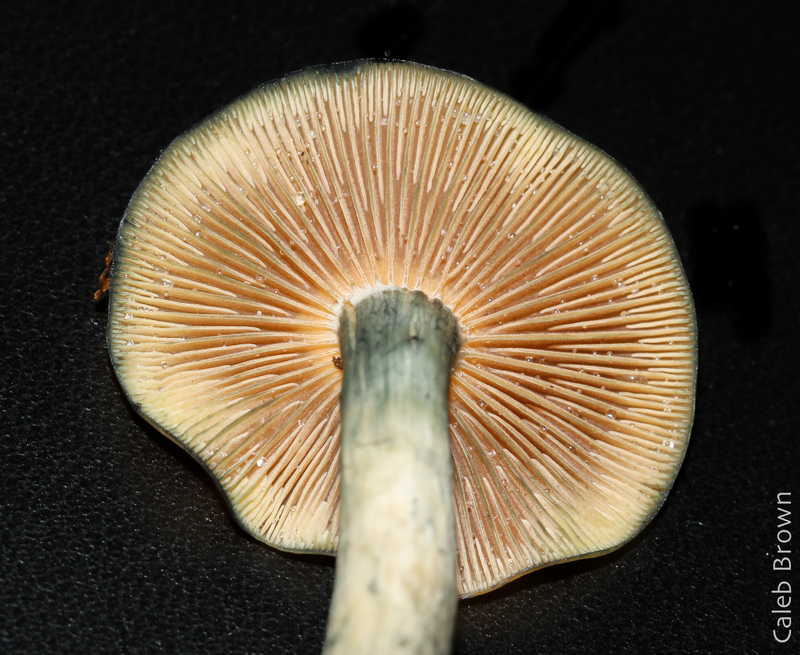 DO NOT confuse with the blue bruising of the true P. cyanescens. Younger specimens will typically have the margins of the caps rolled inwards. Quite different from the bottle cap shapes that young P. cyanescens displays. 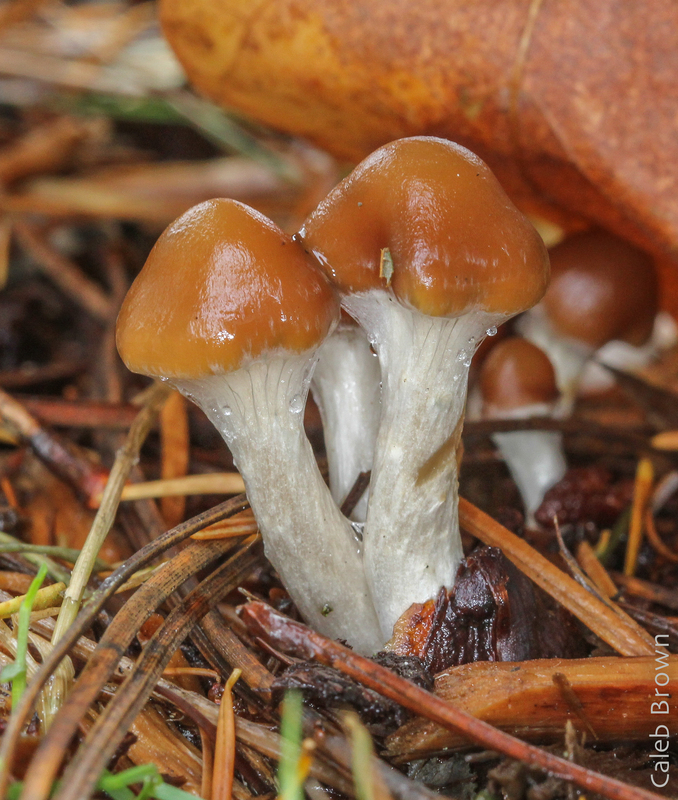 Refer to the young P. cyanescens photo at the top of the blog post. 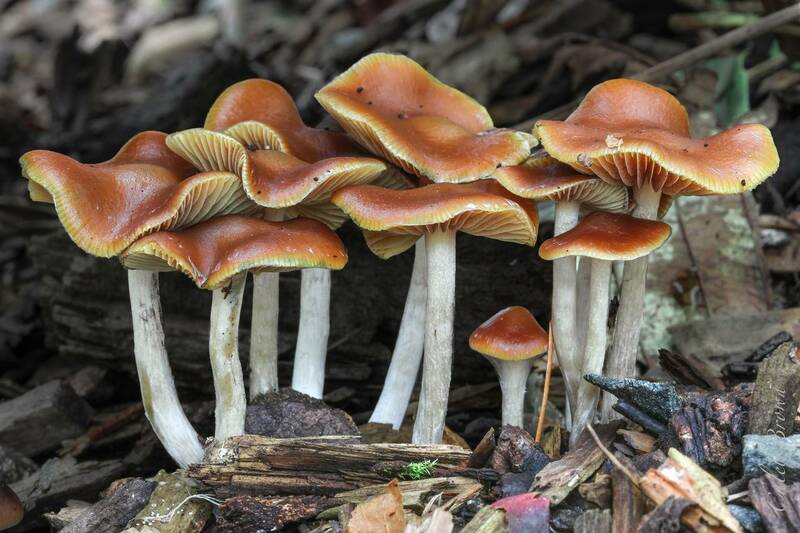 It can be easy to get excited at the caramel cap color when you notice it in the field, but you should know by now that that doesn’t necessarily mean you’ve found Psilocybe. It takes more than one precaution to be sure that you’ve found what you’re looking for. 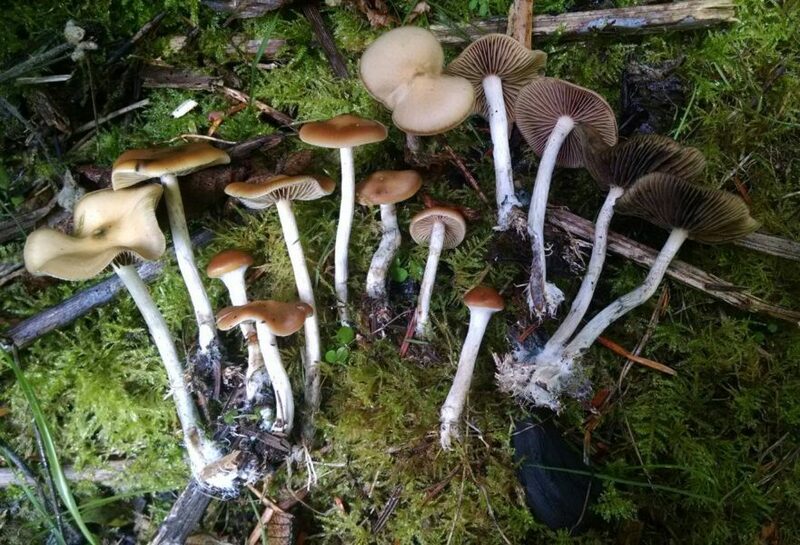 In the end, after you’ve cross-referenced everything and done all of your own homework, make an ID request that’s called something like “ID request P. cyanescens”. Refer to our blog post on making an ID request. You now need not fear death or sickness when searching for Wavy Caps. Remember, knowledge isn’t power, but applied knowledge is. For even more detailed lookalikes, download our pdf pocket guide below! I found some fungi that meets every description provided of the “good stuff”. Still I am uncertain as of it’s edible properties, even after doing a side by side comparison (via pics). Can you help? I am very curious! Sure luvmnkee. Send me an email to john@fungiflora.com. Very helpful. I found some Tubaria furfuracea this morning on woodchips in Oakland. I knew they weren’t it because of stem color, but I picked them anyway as I didn’t know what they were. This helped me right away. 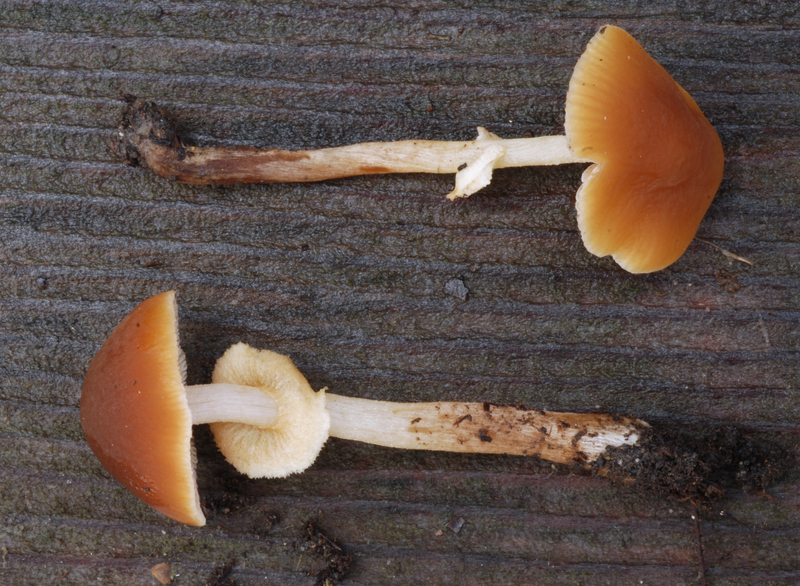 Is the 1st picture a positive identification of cyanescens or their look a likes? Wonderful spore print comparison, and I LOVE that you *encourage* arming oneself with applied knowledge and *cultivating* curiosity about mushrooms! Bookmarking this awesome resource and recommending it to everyone! Thank you SO much, from one mycophile to another! I’ve got what appears to be cyanescens growing in mulch in my flower bed. If it’s the real deal will the stems stay white? Cuz the got a light brown tint towards the dirt and mulch? I also have a few pics. I could send, and how would I send them to u? Hey John I found some mushrooms that fit every description but the bruising it doesn’t bruise any color. Is the bruising critical? 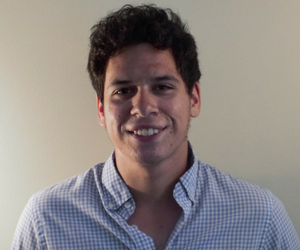 John, great blog–have been using it the past few days (novice identifier here). I live on the Olympic Peninsula–prime mushroom territory–and found some in my yard that I think are Psilocybe azurescens, but I can’t tell for sure. They were growing next to a downed tree and stump. My house is literally up against the forest (15 feet from garage) on a very wooded lot–20 minutes from the coast. My attempt at a spore print was a bust–no print, which I know isn’t characteristic of the psilocybe azurescens (I’ve struggled getting any helpful prints with anything I picked). Would it be ok to send a pic or two and see if you can offer any tips on identifying? Either way, many thanks for the helpful site. Hola, tengo algunos que estoy casi seguro que son Psilocybe cyanescens, me podrías ayudar a saber ? I came across some very unusual mushrooms in my potted plants. They are like a new subspecies that I just can’t find anywhere online. 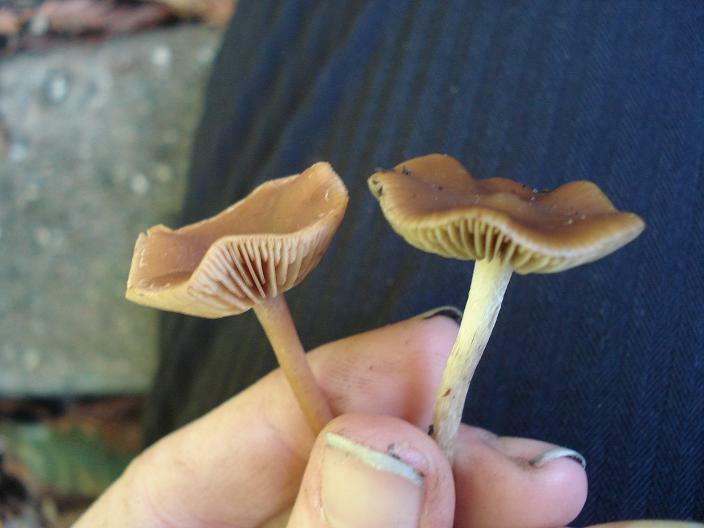 They look exactly like the cyanescens, leave a purple/black spore print, but the stripe is light brown/tan and there is no bruising at all when damaged. While I have no interest in ingesting these, I was very curious what they were. If they are from the psilocybe or tubaria family I was just going to leave them be, but if sinister, I was going to treat the soil and kill them off. I’m happy to share pictures. Seems like the easiest way to rule out all of these is to check if the gills are a dark grey/black or if they are white/orange/beige.